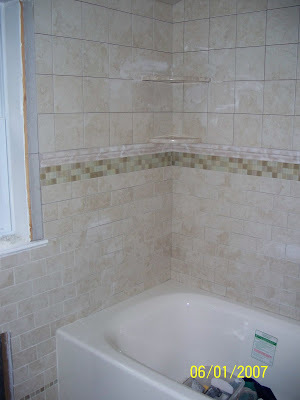 I know, I know... you're all saying "let it be something other than tile." I feel the same way. But, here it is again. 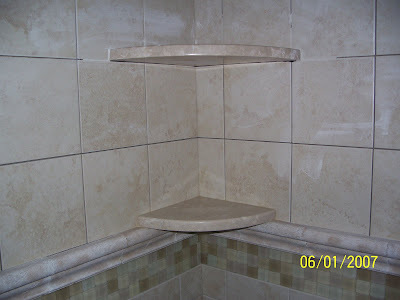 Tile. Isreal put up the shelves. One large, one small. Close up of shelves. 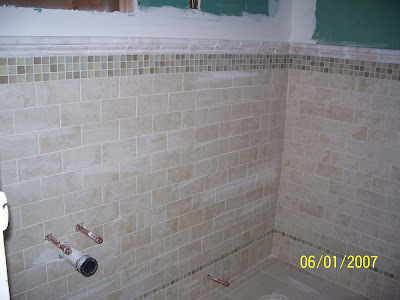 You can also see the grout is not complete in the bath section yet. 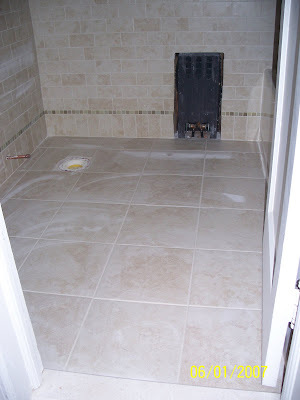 The floor is also completed with grout. We do still need to find a cover for the heater. They said it could just be painted... but since it will get hot that's not really the thing to do with a 2 year old in the house. So... I'm going to search the internet for heater covers. Here is a close up of the floor and wall details. Isreal said those little glass tiles were a pain... but I'm so happy with the final result. 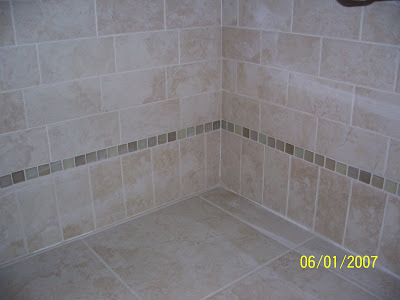 Once the tile is wiped down it will be absolutely beautiful. I'm sure you all know how thrilled we will be when (if) the plumbers come and get the sink and toilet and fixtures in on Monday. We need to spend a little time this weekend finding the accessories (shower curtain, bath mat, tooth brush holder). And, we need to pick up some paint primer and paint. Best Shot Monday! Always wet.